The Houston location of Doc's Motorworks is closing. The apparent replacement is Ruggles Ice, a new concept from controversial chef Bruce Molzan. Photo by Hank On Food. As verified in-person last night by Houston Food Finder freelance writer Beth Levine, Doc’s Motorworks at 1303 Westheimer is closing. Until Christmas Day, all beer and shots of liquor are $3. 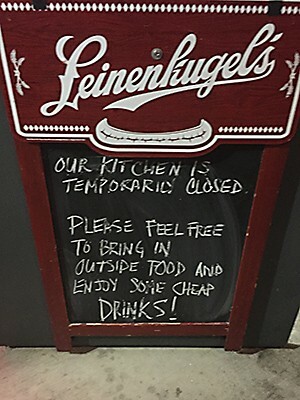 The kitchen is already closed, but patrons are encouraged to bring in outside food. Reduced hours of 5 to 11 p.m. are in effect as well. Updated, 12/21/2017, 1:34 p.m.: Although a bartender told Levine Doc’s Motorworks is closing on Christmas Day, the outgoing voicemail message says it will only be open through December 22. So, hurry in if you want those cheap drinks. Management of Doc’s Motorworks have not responded to an emailed request for further details regarding the closing. Just over a year ago, the company closed its South Congress location in Austin due to impending construction on the block. 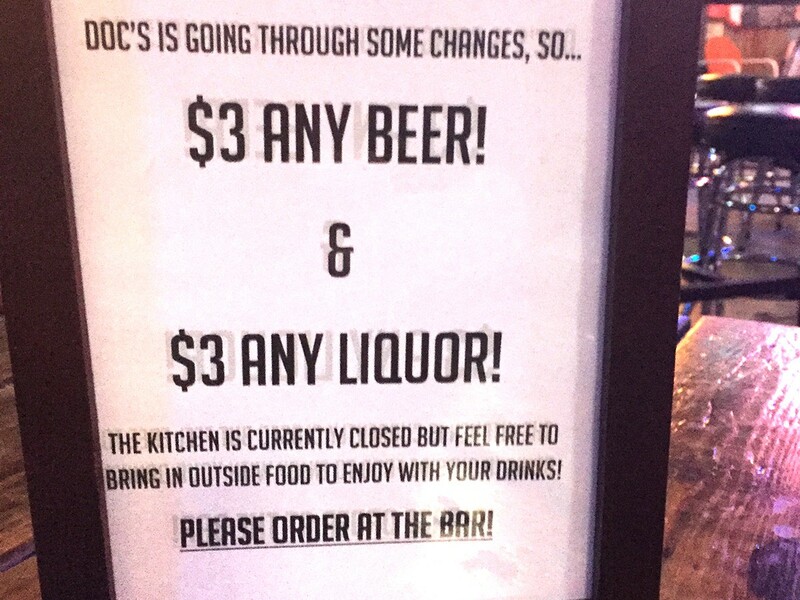 Doc’s Motorworks is selling booze cheap before it closes for good. Photo by Beth Levine. What is perhaps more surprising than the closing, though, is what’s slated to open in that location next: Ruggles Ice, an icehouse. A reputable source who wishes to remain anonymous says controversial chef Bruce Molzan, who has long been associated with the Ruggles name, is involved with the new business. On November 13, 2017, an assumed name for Ruggles Ice using the current Doc’s Motorworks address was filed with the Texas Secretary of State. 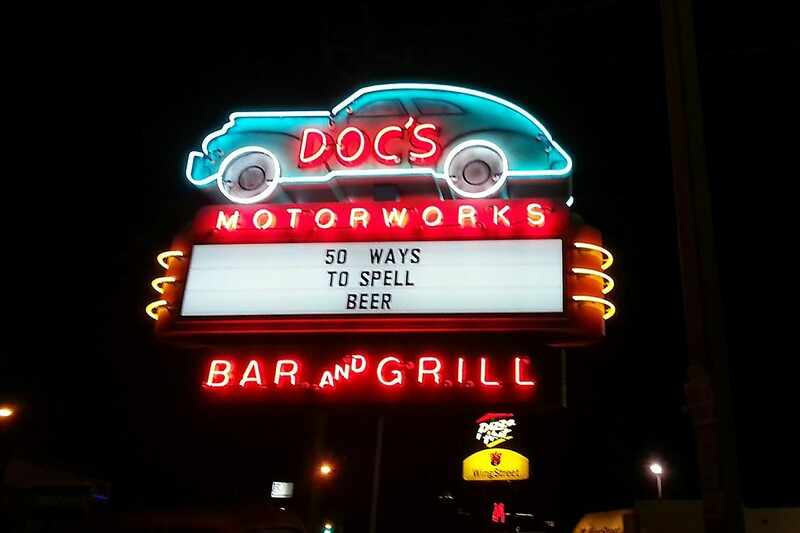 Doc’s Motorworks has already closed its kitchen, so outside food is welcome until it shutters for good on December 25. Photo by Beth Levine. Molzan made headlines earlier this year when he was accused by Texas Parks & Wildlife of “operating an illegal seafood network”—the largest operation of its kind ever in Texas. The department conducted a two-year investigation and believes the ring has existed since 2013. (It is worth noting that Molzan was no longer involved with Ruggles Green as of October 2016 and the majority owner, Hargett Hunter Capital Partners, was not accused of wrongdoing. The restaurant name has since been changed to Bellagreen.) Houston Food Finder has contacted a Texas Parks & Wildlife media officer for an update on the accusation and we’ll update this article should we receive new information. It’s not the first controversial situation surrounding Molzan. As previously reported, in 2011, employees of one of his previous restaurants, The Ruggles Grill, walked out alleging nonpayment of wages. Ruggles Grill closed and Molzan next went to Corner Table—after suing his accusers. More than a year later, employees who said they still had not been paid back wages and tips picketed Corner Table. Molzan’s response was to send out two pizzas. All of that is on top of a trail of civil lawsuits, both filed by Molzan and against him in multiple business dealings, as detailed in 2012 by the Houston Chronicle. Sources say Ruggles Ice is anticipated to open mid-January. How much for the leinenkugels sign?